In a small bowl, mix 3 tbs of flour and yeast and water. Let sit for about 10 minutes till foamy. In a stand mixer combine the remaining ingredients, add the yeast mixture and mix until the dough is smooth for about 8 minutes. It will be very sticky. Dump the dough on a floured surface and knead with your hands for a couple minutes adding a little bit of flour to make it firmer. Transfer the dough in a large container, seal with plastic wrap, and rise for about 3 hours. Instead of letting the dough rise, you can place it in a plastic bag and refrigerate for up to 4 days. Pull it out of the fridge and let it stand for 3-4 hours in room temperature before proceeding to the next step. Make pastry cream (see recipe below) right after the you mix the dough to give it enough time for cooling down. Shape the braid. Line a heavy baking sheet with parchment. Roll the dough on a floured surface into a rectangle about 13×16 inches and about 1/8 inch thick. 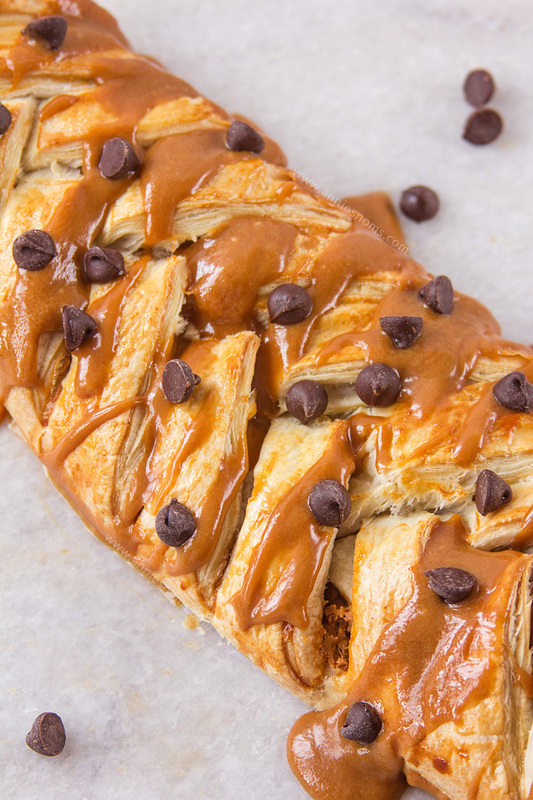 Apply the chilled pastry cream over the dough and sprinkle with chocolate chips. Roll it into a 16-inch cylinder. Cut the cylinder in half lengthwise and arrange both halves parallel to one another with a cut side facing up. Wrap them around each other starting in the middle, pinching the edges of the braid together. Cover loosely with plastic wrap and let stand at room temperature for another 35-45 minutes. Brush the beaten egg over the braid. Bake until golden brown for about 40 minutes. Let cool on a rack for 1 hour before slicing.